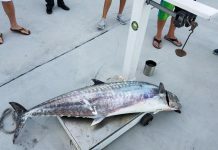 Most king mackerel fishermen readily acknowledge they catch a lot of kings trolling lines below the surface. 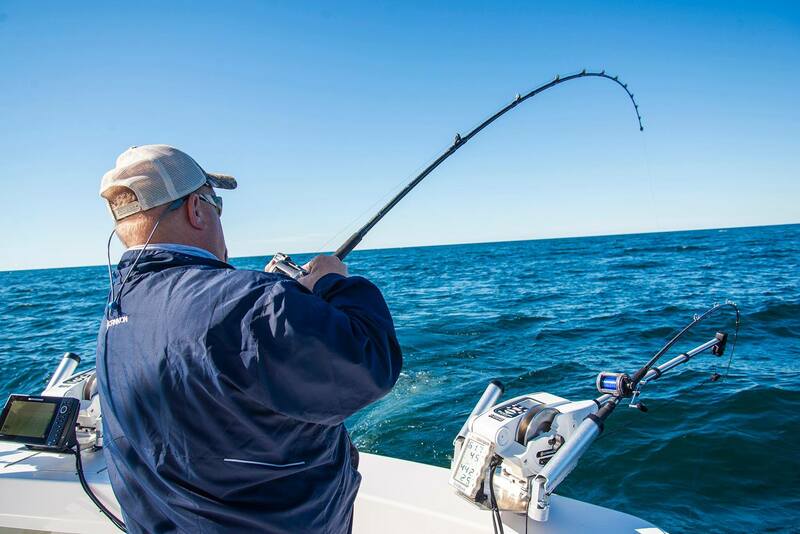 Slow trolling is the primary fishing technique for tournament and non tournament anglers seeing kings and it also works for other species, such as cobia, amberjack, dolphin and large Spanish mackerel. Trolling offers a way to present baits to a lot of fish over a large area around structure that is holding baitfish, but when fish aren’t at the surface, you must get the bait or lures down to them or you’ll be eating fish bought at the fish market and not heading to the scales during tournaments. There are two primary ways to troll baits below the surface, using planers and using downriggers weighted with heavy lead balls. At slow trolling speed planers don’t dive, so downriggers become the tool of choice for fishermen slow trolling live and dead baits. 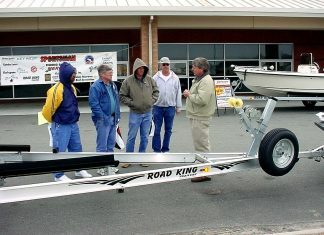 Downriggers are those large reels with short stout rods that are mounted on the gunwales or transom of many fishing boats. The rod, or arm as it is properly called, is stout to handle the weight of a downrigger ball or the strain of a planer when trolling faster. Downrigger arms can be fixed short or longer lengths and some telescope to multiple lengths. Longer downrigger arms can be more difficult to use, but hold the line away from tangling in the propellers or hardware on the boat’s stern. Most downriggers are designed to use 135 to 150 pound test braided cable and all come filled with it. However, Cannon Tournament Series Downriggers are designed with a solid stainless steel spool to allow fishermen to convert them to using mono line if they prefer. The downrigger reel and line are calibrated to a counter that displays how much line has been removed from the spool – which translates to the depth of the downrigger ball. When switching the downrigger line, it is important to use a similar diameter as the wire so the calibration remains correct. A larger diameter line will also deflect to the rear while trolling (blowback) and not be straight down or reach the depth indicated. The line on a downrigger attaches to the reel on one end and winds on around the reel for 150 feet or more, then terminates with a heavy duty snap swivel at the other end. The swivel attaches the weight or planer that pulls the line down. Planers rely on forward motion to dive and do not work well for slow trolling. Many downrigger manufacturers recommend against using planers with them because of the extra stress they put on the downrigger and mount when moving forward quickly enough they dive. Downrigger weights typically resemble a cannon ball with a small fin, but some are flatter or longer and more round and some are shaped like fish to cut through the water easier. The downrigger release is key to successful downrigger trolling. The release attaches to the downrigger ball, or the downrigger line just above the ball, and holds the line from the rod and reel going back to the bait. When the fish hits, the line pulls from the release and the fisherman fights the fish on a regular rod and reel. The downrigger line and ball are reeled to the surface where they are out of the way during the fight and ready to be reset as soon as the fish is landed. 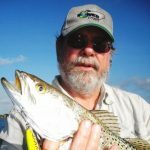 Fresh water fishermen have been using downriggers for most of a century and the multiple downrigger and multiple line setups they fish for salmon, lake trout and other species are amazing. Many use up to 6 downriggers to troll 10 to 15 line spreads of lures and natural baits and rarely tangle. They do not use live baits on downriggers. 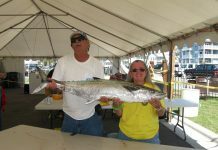 King mackerel fishermen were introduced to downriggers as a means to slow troll live baits at a set and known depth for king mackerel. The frisky live baits king mackerel fishermen use to catch kings will try to swim together for protection. 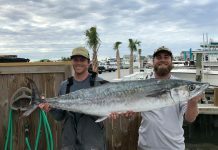 This tendency presents occasional problems with tangling lines, so most king mackerel fishermen only use one or two downriggers and they typically troll a single live bait from each one. There are two primary categories of downriggers, manual and electric. With manual downriggers, the fisherman provides the power to drop the line to the desired depth and crank the ball up after a strike. All electric downriggers will drop the downrigger ball and retrieve it after a strike – and some will do more. 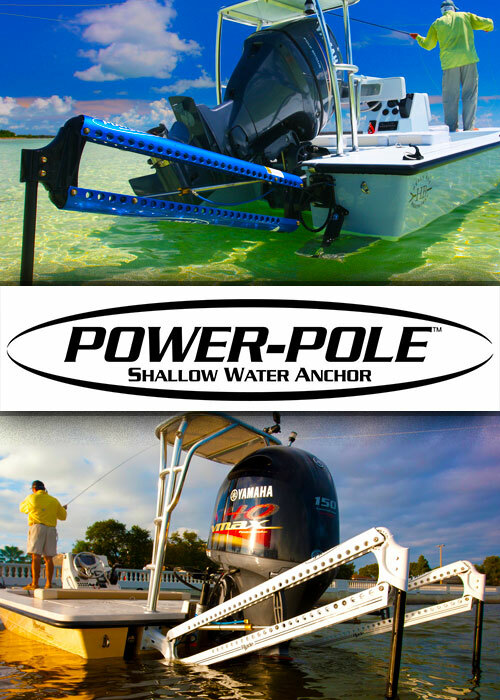 Electric downriggers in the upper price range have an assortment of special features such as programmable depth, bottom tracking, variable depth jigging and releasing a minute electrical discharge into the water as a fish attractant. 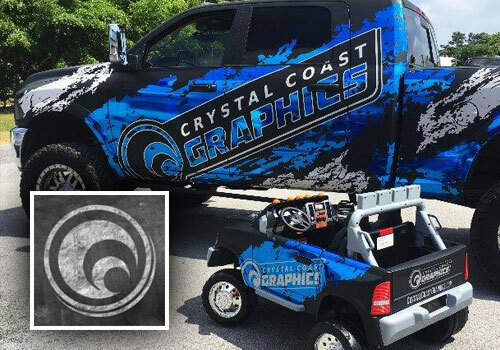 Unfortunately, salt water and salt air cause corrosion and constant exposure to them can play havoc with electrical connections. This is the weak link with electric downriggers. Electric downrigger connections must be properly installed with all the spray shielding possible and the connections must be regularly cleaned and maintained for corrosion prevention. 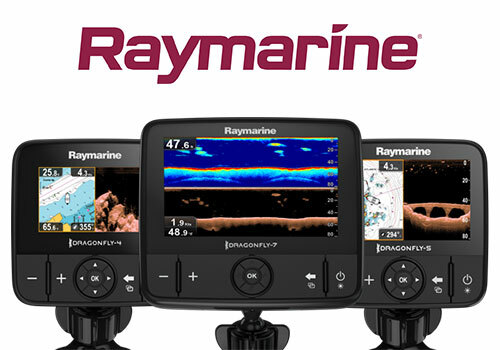 Some electric downrigger features can be unique fish catching tools. However, when they don’t work electric downriggers are just in the way. The braided cable that comes standard on downriggers is there for a purpose. It is strong for its diameter and will carry an electric charge. It doesn’t feel particularly abrasive, but will quickly cut mono fishing line that is dragged across it. As king mackerel sometimes run forward after they strike, they may drag a line across the downrigger cable and cut it. For years, king mackerel fishermen looked for a substitute downrigger line. With the exception of the Cannon Tournament Series, downrigger manufacturers warn against using other than braided wire on downriggers. 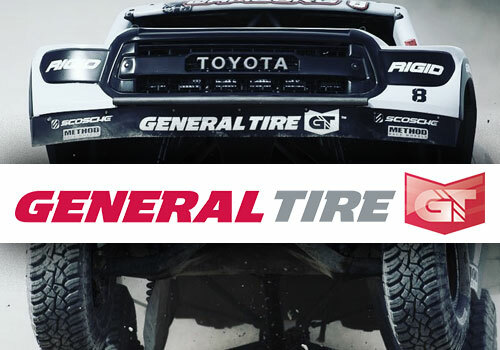 The concern was the durability of the spool with smaller diameter lines or lines that stretch. Mono was the first substitution and it stretches, especially when wet. This isn’t bad while fishing, but caused extra stress when stored at the end of the day. The still wet and stretched mono was wound on the reels and it tried to return to its normal length as it dried. This stress was more than many spools could stand and it sometimes crushed or split them. Some fishermen substitute super braid lines for downrigger cable as they are very strong, small in diameter and have virtually no stretch. Their diameter is 1/3 to 1/2 of similar strength mono and also noticeably smaller than similar strength braided cable. This creates its own problems as the smaller diameter pulls into gaps on the spools the wire or mono wouldn’t and jams the reel or cracks the spool. Monofilament or fluorocarbon line of the same strength as the standard braided wire downrigger cable is larger in diameter and causes excessive blowback (deflection of the downrigger line due to the drag of it being pulled through the water). The smaller diameter super braid lines eliminate almost all blowback, but are abrasive, maybe even more abrasive than the original braided wire, and readily cut mono lines that are dragged across them.. I prefer mono line on my downriggers for king mackerel fishing. Sometimes you just can’t react fast enough when a fish strikes and it wraps around a downrigger line. Mono has several unique properties and one of them, which I jokingly refer to as Murphy’s Law of Moving Mono, is that when two mono lines tangle or rub, the moving line will cut the stationary line regardless of the difference in strength and diameter. I’ve lost a few downrigger balls and releases, but have landed some large kings that would have broken off otherwise and I consider that a reasonable trade-off. My downrigger setup leaves the original wire on the spool and adds 150 feet of 80 to 100 pound monofilament. The wire acts as a pad for the mono line and helps cushion the downrigger spool. The mono is lighter as it is matched to the diameter of the original braided wire line that comes on downriggers. Yes, it’s lighter, but still has plenty of strength to hold a 10 pound downrigger ball. I know this line stretches while using it and at the end of the day I take a few minutes to release the pressure and ease the stretch, which also eases the stress on the downrigger spool. This is really simple and can be done while running back to the dock. I simply remove the downrigger ball and let out a little more line than was used at the deepest setting that day and pull it for a few minutes to allow it to relax and return to its unstretched length. Then reel it back in slowly, with no pressure, and layer it evenly on the spool. There are several companies that make downriggers. A quick Google search turned up Penn, Cannon, Scotty, Seahorse, Walker, Attwood, Big Jon and Elec-Tra-Mate and there may be more. Actually Penn no longer makes downriggers. There are still plenty of Penn Downriggers around and in use, but they sold the rights for their design to Seahorse and they have made some improvements and are making them now. The look is very similar. I have sets of older Penn and Cannon Downriggers. My downrigger setup has worked on the Penn downriggers for years with no issues. There were concerns it would split the spool, but after more than 20 years, it hasn’t. I believe releasing the pressure before storing them, even if only overnight, is the key to this. I tried this on my older Cannon downriggers before they introduced the Tournament Series and it didn’t work well until I made some modifications. The Cannon Tournament Series downriggers use a one piece stainless steel spool and don’t have any issues. They are the way to go if you like Cannon downriggers. However, if you have older Cannons with the black plastic spools, there are a couple of ways to modify them to work pretty well using mono as the downrigger line. NOTE: This worked for me, but I can’t guarantee it will work for all, so modify your Cannon Downriggers at your own risk. Cannon uses a two piece spacer on the spool and occasionally the stretched mono crawls over the edge and jams between the spacer and the spool. If allowed to continue, this will spread the spool until it cracks or jams in the downrigger body. There are two ways to keep this from happening. The easiest is to make a U-shaped liner of plastic, like from a heavier gallon jug, to put on top of the spacers, with the liner sides running up the spool a bit to keep the line from getting outside of the liner and in the cracks. The line is wound on top of this liner. This works, but wears and will have to be replaced occasionally. My other modification for this isn’t pretty, but has worked well for a bunch of years. I’m sure it voided the warranty on the downriggers, so be aware of that before you even consider this. I installed a series of eight stainless steel bolts from side to side through the spool to tighten it together and prevent the mono from crawling over the edge of the spacer. It isn’t particularly pretty, but it does the job well. This modification was done to the downriggers I already had. If I was buying new Cannon downriggers, I would purchase Tournament Series models and simply switch them to mono. Some fishermen like to remove the wire from any downrigger as it tends to vibrate and hum. I never found this to turn fish away, but don’t regret the downrigger not being noisy. I don’t suggest removing the wire, but adding 150 feet of similar size mono to it. The wire will cushion the spool some and you shouldn’t fish deep enough it ever goes back in the water. An Albright Special knot works for connecting the mono to the wire and I tape over it to be sure there aren’t any ends to poke and fray the mono. Some times the fish are deep and the only way to get live baits down to them is trailing behind downriggers. If you are marking bait, position one downrigger about 5 feet above it and set the other downrigger bait approximately halfway between the bait and the surface. Fish see up much better than down. If you aren’t marking bait, A good starting point is to position one downrigger 2/3 of the depth to the bottom and position the other downrigger 1/3 of the depth to the bottom. In 60 feet of water, the deep downrigger would be 40 feet deep and the shallow downrigger would be 20 feet deep. Adjust them up or down to get both in the same general depth if you notice more strikes coming at one of the depths. Now get out there and get down and catch some kings! NOTE: If you change the downrigger line on an electric downrigger with the auto stop feature, be sure to check it before going fishing. Some auto stop mechanisms create a ground in the water through the downrigger wire and stop when the ground is broken and some use counters to stop. Monofilament counts well, but doesn’t conduct electricity and this prevents the ground type of auto stop mechanisms from working properly. Your owner’s manual or a quick check should tell you which you have.